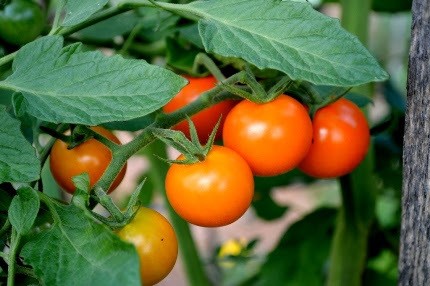 Warm weather has arrived and it is time to plant your veggie gardens. This is officially called “Veggie Week” here at Natureworks because the majority of our wa rm season plants have arrived early this week. After tagging our pre-book orders, our benches are filled to overflowing with ORGANIC seedlings of every kind. We are thrilled to be working with a new supplier this year. My friend and long time grower Lloyd Traven is the leader in the greenhouse industry in organics. The only pest control he employs are beneficial insects. 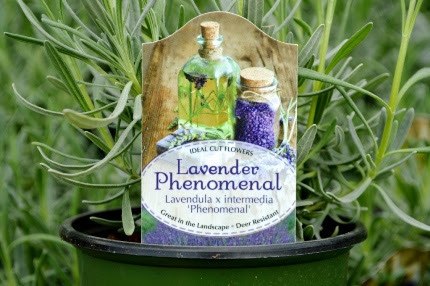 Not only are his veggies beautiful, you should see the herbs and annuals- 10 varieties of basil alone, and tons of Lavender ‘Phenomenal’, bred by Lloyd at his farm. 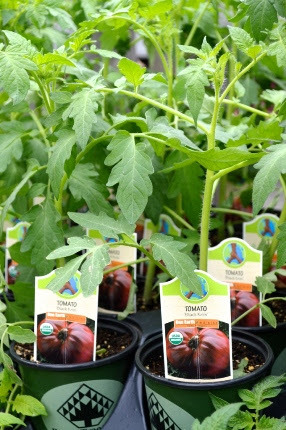 It is great to have a good organic source for ornamentals as well as edibles. Even if you have been buying veggies from us for years, I guarantee that you will be VERY impressed this year. 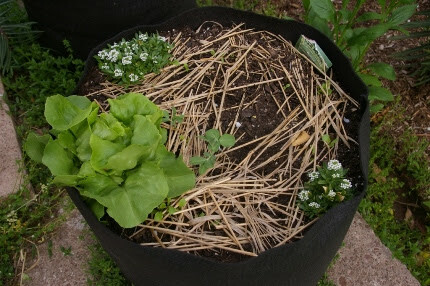 Peas, lettuce, and sweet alyssum in a Smart Pot on the south side of my house. We are open this Thursday evening until 7 pm and I am giving a FREE workshop on Growing Amazing Plants in Smart Pots. The details on this workshopare below. 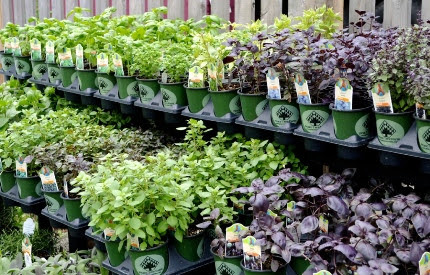 We are also stayingopen on FRIDAY NIGHT until 8 pm to allow you to pick up your vegetable plants ahead of the weekend rush. We will combine this special shopping night with a wine tasting featuring wine from local vineyards. This weekend is always our busiest two days of the spring season. Shop early, enjoy some wine, and be ready to plant when you wake up Saturday morning. Every day we field lots of questions about how to prepare the soil for planting, what organic fertilizer to use, and more. We have put together what we call our Vegetable Success Kit. Our Saturday morning garden walk is devoted to Edible Landscaping. 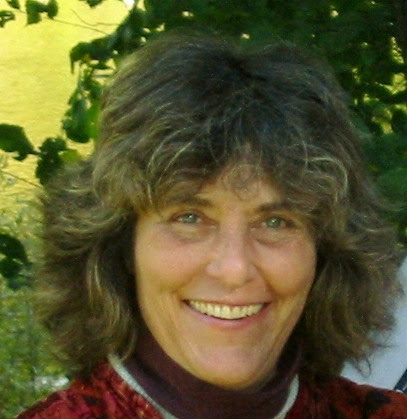 Following that, my buddy Cameron Bonsey from Coast of Maine will be visiting us. 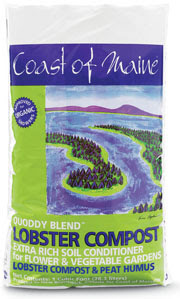 At 11:00, he will be talking about how their lobster compost is made and how to use it to improve your soil. 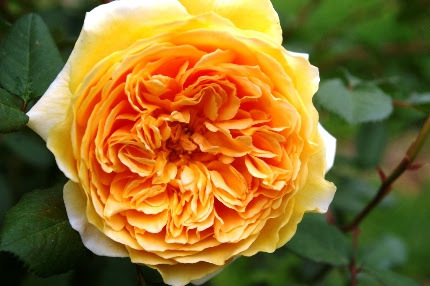 This is a David Austin rose named ‘Crown Princess Margareta’. It is so fragrant! seven days! 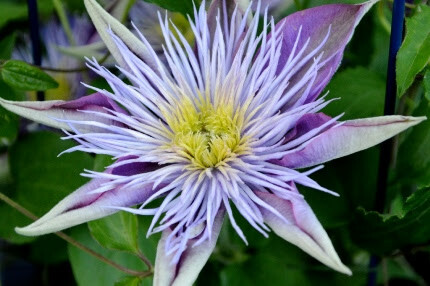 Our clematis vines are just out of this world (once again, a new supplier that we are thrilled with). Many roses have arrived, as have peonies, tree peonies, and hydrangeas. The warm season annuals are also here, including a new Garden Geek line of crazy varieties, all organically grown. 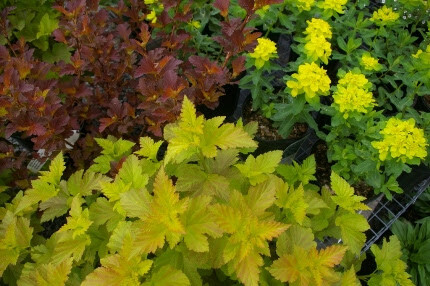 New shrubs arrived this week including Physocarpus ‘Lemon Candy’, paired above with perennial Euphorbia (cushion spurge). We finally have organically grown butterfly weed- three types. The traditional orange variety (Asclepias tuberosa) wants full sun and good drainage. The plants are young, as they are just breaking dormancy, but the root systems are robust. We have a new milkweed relative, Asclepias speciosa, which is called showy milkweed. It does not form large colonies and grows 2-5′ tall, depending on soil conditions. The tropical variety (Asclepias curassavica) is a non-stop bloomer, flowering until hard frost, and it has an orange/yellow bi-color flower. We plant it both in containers and right in the garden. All provide both larval food plant for the monarch butterflies and nectar as well. Our common milkweed crop is in production and we will be sure to notify you when that arrives in the nursery. Our basil bench this week! A dozen varieties and counting, many we’ve never carried before.